Perhaps a more accurate geographical descriptor for the coffee origins we focus on this month may be African Great Lakes coffees rather than Central Africa coffees. The growing regions that produced almost all of the thirty coffees we cupped this month are clustered around or near the gigantic lakes that dominate the geography of the mountainous central-east region of Africa, at or near the equator and just to the east of the geographical center of the continent. Particularly important in this coffee geography is Lake Kivu, which influences the coffees of Rwanda and the Democratic Republic of the Congo, and the northern end of Lake Tanganyika, which may influence Burundi coffees. Farther south, Lake Nyasa pokes up close to the Mbeya growing region of Tanzania. What generally can be said about the coffees of these lake regions? They are all high-grown though typically not extremely high-grown (accounting for their moderate yet vibrant acidity); they are almost universally produced from well-established local variants of the great heirloom Bourbon variety of Arabica (accounting for their complex and engaging aromatics and flavor); they are produced by small holders (making them attractive to programs that seek to improve the lives of small-holding farmers through encouraging specialty coffee production); and the best are processed, usually by the classic ferment-and-wash method, at often recently established “washing stations” or wet mills, making them relatively clean and consistent. In all cases, transporting these fine coffees out of these landlocked regions is difficult, often causing quality problems, but of the thirty samples we cupped, only four displayed mild suggestions of bagginess or fading owing to storage or transport, a tribute to the commitment of the importers. The African Great Lakes region even shares its own special cup taint, the startling “potato defect,” which particularly affects Rwanda coffees grown near Lake Kivu. The defect apparently is set off by a bacteria introduced under the skin of the coffee fruit, usually by a species of coffee borer. The bacteria causes a compound to develop around the bean that produces a memorable raw potato taste – imagine the smell of an old, sprouted potato pulled out of the compost and cut up raw. Beans carrying this taint apparently can only be identified by visual examination when the coffee is still in its wet parchment, fresh from washing, and the tainted beans must be picked off the drying tables by hand, one by one. Nevertheless, of the thirty coffees we cupped, we encountered only one sample that produced a clear potato-tainted cup, a tribute, in this case, to the skilled eyes and hands of the mill workers. Given that we encountered only a few modest sensory negatives, what were the dominant sensory positives of the African Great Lakes coffees we cupped? Generally, syrupy mouthfeel, moderate but always rich acidity, and varying but distinctive aroma and flavor. Typically the best of these coffees were sweet and honeyish with a complicating savory edge. Along with classic citrus and berry and floral notes, they tended to display a range of savory hints: herby, spicy, nutty, agave-like, even peppery. Although some coffee insiders assume that the savory hints represent slight, serendipitous taints caused by drying in moist, often lake-influenced conditions, it seems to me just as likely that also, or alternatively, they represent characteristics of the local Bourbon-based plant material, since a savory hint is also often a component of the classic Bourbon-related SL28 cup of Kenya. Rwanda dominated our cupping both in number of submissions (twenty) as well as in high-scoring samples: six Rwanda samples topped the ratings at 93. All are reviewed here. Three of these six 93-rated Rwandas apparently were from the same green coffee lot, a Karongi Gitesi imported by the same small but excellent green coffee dealer. It is always a bit disconcerting when the same green coffee lot produces multiple samples that attract high ratings in the same cupping, but remember that we cup these samples in random order identified only by number, and hold off on any effort at researching the green coffees or analyzing roast color until well after we have determined our ratings and sensory descriptors. Furthermore, three samples from the same lot of green coffee roasted slightly differently on different equipment give advanced consumers an unusual opportunity to experience for themselves the impact that relatively small variations of roast color and profile can have on the same distinguished green coffee. Keep in mind that we did not edit our descriptions or ratings after we learned that the Orazure, Papa Lin’s and GivCOFFEE Rwandas all apparently came from the same lot of green coffee. Reassuringly, they all ended with the same final rating. But reading between the lines, as it were, of the three descriptions for these coffees, it’s apparent that the lightest roasted treatment, the Orazure, was predictably brightest and lightest in mouthfeel, while the marginally darkest of the three (we’re talking small color differences here), the GivCOFFEE, was deepest and most chocolaty, with the Papa Lin’s positioned between the two. Similar roast-related distinctions can be seen implied by the choice of descriptors for the fruit notes and, less clearly, for the savory suggestions. If you are able to buy them before they sell out, try these three coffees yourself and see what you think about their roast-related differences. When we turn from Rwanda to the other four origins that appear in this month’s cupping, Burundi produced the highest average score by origin, 91, though this impressive average was generated by only three samples. 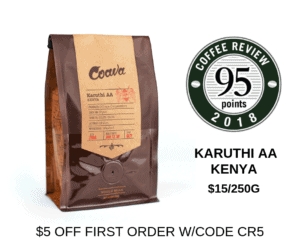 The highest rated of the three, the Revel Coffee Burundi Kayanza Gitika, is reviewed here at 92. Perhaps the most interesting new coffees to come to the table arrived from the far eastern edge of the Democratic Republic of Congo, overlooking Lake Kivu on the opposite side of the lake from Rwanda. The Muungano Cooperative, now with 2,300 members, apparently was founded to help heal the aftermath of the latest episode in the Congo’s seemingly endless string of horrific rebellions and civil wars. The politics behind the formation and recent success of the Muungano cooperative are not clear, at least not to me, given the tangle of interests in the region involving neighboring Rwanda and Uganda as well as Congo. But for certain the Muungano cooperative has had success in attracting members of varying groups and identities, setting off a hopeful version of the same healing that specialty coffee success helped bring to neighboring Rwanda after the civil conflict and genocide there. And this new Congo coffee is quite promising. We received three samples of the Muungano Kivu that together averaged an impressive 90. The highest scoring, the 92-rated Congo Muungano from Kickapoo Coffee, is reviewed here. Finally, we received a lone entry from Uganda: the Uganda Sipi Falls, roasted by the Taiwanese company Pebble Coffee, and certified organically grown as well as Rain Forest Alliance certified. Although the Sipi Falls Uganda is produced on the slopes of Mt. Elgon, opposite Kenya, it retains an association with the Great Lakes; its growing location appears to be less than a hundred kilometers from the shore of Lake Victoria. It was a rather uneven coffee, but quite interesting with its bright, Kenyaish acidity and musky floral notes. We had three samples from Tanzania, topped by the 91-rated Tanzania Shwanda Estate Peaberry roasted by Pebble Coffee. Unlike most of the other samples we review this month, this coffee was grown on a privately owned estate rather than by groups of small holders. And it reflects a conceptual association that dates back to the beginnings of specialty coffee: the association of Tanzania with the peaberry grade. Regular readers of Coffee Review know that peaberries are produced everywhere. They are a kind of bean that results when the coffee fruit develops a single, oval bean rather than the usual pair of flat-sided beans. At the option of the mill operator they may or may not be separated from the flat beans and marketed as a separate grade and product. For reasons that I still don’t understand, the association between Tanzania and peaberry was already well-established in the specialty coffee business forty years ago. Tanzania peaberry almost always appeared on the menus of the new specialty coffee stores of the era, whereas flat beans from Tanzania hardly ever appeared. The profile of Tanzania peaberry back then was expected to be light-bodied but lively, which functions nicely as a very general set of descriptors for this month’s gently lush, lightly floral-toned Shwanda Estate Peaberry.